A summary of some of the activities of Smt. Candrasasi Mukherjee, better known as Pisima Gosvamini, and her Gaura-Nitai. They are in a very small temple right across the street from Bankhandi Mahadeva, about three doors down from the intersection of the Loi and Bankhandi bazars. It looks rather like a closet door, beneath the second floor window of a plain, whitewashed building. I think it's unmarked too. Coming from Krishna-Balarama Mandir, it will be on the left as one heads for Radha-Syamasundar, Radha-Ramana, etc. 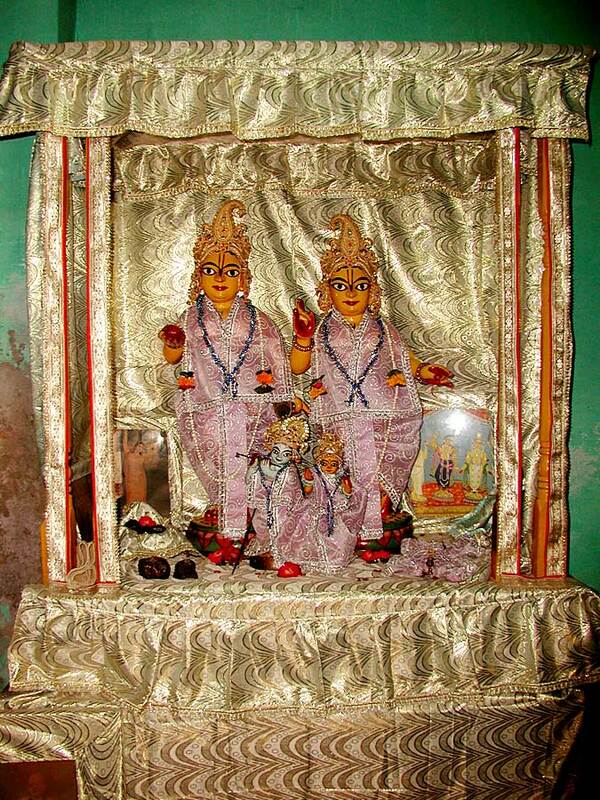 In a village named Rayapura (Siudi District, Bengal), there were Deities of Sri Gaura-Nitai that were worshiped by the descendants of Sri Murari Gupta, the eternal associate of Lord Caitanya. These Deities of the Lords Caitanya and Nityananda in childhood form were worshiped until there was no one left in Murari Gupta's family to look after Them; after an outbreak of malaria, everyone had left the area and it became overgrown by the jungle. The temple was abandoned, the Deities were eventually buried beneath so much foliage and dirt, and having forgotten the history of the place, people began to use the area a pasturing ground for their cows. Once, a gopa noticed that his most productive cow used to drip her milk into a spot on the ground. Curious, they dug in that spot and found the Deities there. Removing Gaura-Nitai, they saw that the word "dasamurarigupta" was written on their base. The Deities were again established in a temple with first-class worship. After some time, and according to directions he had received in a dream, one resident of Orissa, Balaramadasa Babaji, came there and began to worship Gaura-Nitai. Fortuitously, a respectable young brahmani named Candrasasi Mukhopadhyaya had come to Rayapura on business related to her wealthy family's nearby land holdings (around year 1900). She happened to be staying near the Gaura-Nitai temple. Daily taking darsana of the Deities, a desire to render Them service arose in her - she wanted to make Them some payesh (sweet rice khir) for Their bhoga offering. She later had a dream in which Gaura and Nitai came to her, saying, "Ma, we're very hungry. Feed us some payesh that you've cooked for us." When she later told the temple priest Balaramadasa Babaji about this, he said, "According to Vaishnava sastras, an uninitiated person cannot cook for the Deity." Smt. Candrasasi Mukherjee then accepted her mantra from Balaramadasa and thus she fulfilled her desire to prepare bhogas for Gaura-Nitai with her own hands. That very night in a dream Gaura-Nitai came again and pulling on her ancala (the edge of her sari) said, "Ma! Don't go away. If you go away, who will feed us payesh? You are our Mata. We won't let you go." Candrasasi affectionately smiled and told Them to let go of her cloth, but They wouldn't let go; from Their repeated tugging at her ancal, a piece of it finally ripped and the swatch of her cloth was in Gaura's hand. Candrasasi's dream broke and she woke up. But she saw that the corner of her ancala had indeed ripped! At that very moment, she went to inform Balaramadasa everything about her dream. At that time, before the sun had risen, the temple wasn't opened yet. Balaramadasa went to the temple to wake the Deities. To the amazement of all present, everyone saw that the piece missing from Candrasasi's cloth was in Gaura's hand. All were immersed in premananda and everyone began to praise Candrasasi's good fortune. Candrasasi lost all sense of her body and mind, and began to dive and surface in thousands of unprecedented, transcendental feelings all at once. She forgot all thoughts of going back to her native place. The illusions of family, prestige, wealth, and so forth had been lost. She began to serve Gaura-Nitai in the temple as her life and soul. On account of her leaving home at such an age (she was only 20 at that time) to live in the temple along with the Babaji, people naturally began to talk about their relationship in so many ways and this gave her intolerable mental distress. One night, after praying repeatedly and having emptied her heart before Gaura-Nitai, she eventually fell asleep in that state. Gaura-Nitai came to her in a dream and hanging on to her neck They said, "Ma, take us to Vrndavana now - chalo (let's go)." Immediately she took Gaura-Nitai and along with Balaramadasa Babaji proceeded by boat to Vrndavana. As They arrived there, a devoted lady from Nadiya named Bhakta devi was bathing in the Yamuna and saw Them. She respectfully invited Them to her home in Vanakhandi-mohalla. In great ecstasy, Candrasasi began to serve Gaura-Nitai in her home and Bhakta devi used to assist her. People in the neighborhood called Bhakta "Pisima," and so they began to call Candrasasi "Pisima" as well. Consistent with the Lords' statement to that effect, Pisima used to dandle and nurture Gaura-Nitai as if They were her own sons. Gaura-Nitai were always pleased by her service. One day, as she was busily cooking for Them, she noticed indications of her monthly stri-dharma. Going outside of the temple kitchen, she remained in the courtyard looking again and again in the direction of Gaura-Nitai and crying - "Today I won't be able to offer my own cooking for Gaura-Nitai's bhoga!" Thus suffering over the matter, she saw a kind of dream-vision, even though she was awake. Both brothers, Gaura and Nitai, came and said, "Ma, there's nothing to be sad about. You just do what mothers in your condition usually do. There's no fault in that. Get up. Take your bath and give us something to eat. We're very hungry. From now on, you'll be free of this disease." Pisima did as she was told. After that, she never had her courses again. After coming to Vrndavana, Sri Sri Gaura-Nitai began to play with many other devotees and perform various pastimes. Sometimes, if there was a need for this or that, they would beg, borrow, or steal it from anywhere and everywhere. For example, Gaura-Nitai had no shoes. They asked Pisima for them, but since she didn't want Them to leave her even for a moment she probably simply told Them, "What do You need shoes for? Do you have to come or go anywhere?" Thus, Gaura-Nitai remained on the watch for some other devotees who might come there. Once, in the month of Savan, a woman of a Bengali family traveling from Serpura Beguda came to Vrndavana to see the swing festival. 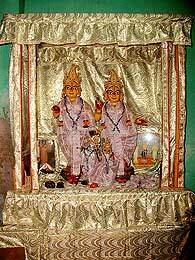 They stayed near Gaura-Nitai's temple, in Cidiyakunja. That very day, in the midmorning it was raining. Pisima was sitting on the temple veranda. With her left hand, she was pulling the rope attached to Gaura-Nitai's fan. With her right hand, she was chanting on her japa-mala. It began to rain very hard. Pisima dozed off a little. At that time, she saw that Nitai had left the temple and was running about the courtyard in the water. Gaura then followed Him. Pisima shrieked, "Oh! Where are you going? You'll catch a cold!" This dream was as clear as if it weren't a dream at all - it seemed as if she saw it while yet awake. But she again began pulling on the pankha and eventually dozed off again. Meanwhile, Nitai-Gaura had arrived in Cidiyakunja. The woman from Serpura Beguda was sleeping at that time. Gaura-Nitai went in and sat at the end of the bed. Shaking Their heads, they said, "Have you come here to sleep? Get up!" In her sleeping state, the woman mumbled, "Wha... who are you?" "Our names are Nitai and Gaura; we're the sons of Pisima of Vanakhandi." "People in the mohalla just call us Pisima's boys. Everybody in Vrndavana knows we're her children." "Look at how our feet are covered with mud. Give us some shoes." 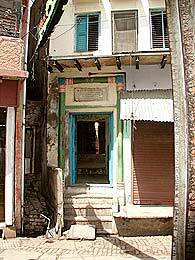 "Is this the house of Pisima's Gaura-Nitai?" "Yes, mother, this is the home of Pisima's Gaura Nitai. Mataji, why are you crying?" "Where are your two boys? I want to see them," the highly agitated woman said, trying to be demure and respectful. Pisima respectfully seated the woman and opened the mandira. Taking Gaura-Nitai's darsana in the temple, which exactly resembled the vision in her dream, the woman burst into tears. Her very being was filled with trembling in all her limbs. She was simply unable to do anything at all; for a long time she remained fallen on the floor in a state of faint. Upon coming to consciousness and controlling herself, she related the whole story of her dream to Pisima. Pisima too told of what she had seen. For quite some time, both simply remained in an embrace, shedding tears of ecstasy. That fortunate woman later made silver shoes for Gaura-Nitai, which remain in Their possession even today. Nitai and Gaura continue to use them with love. 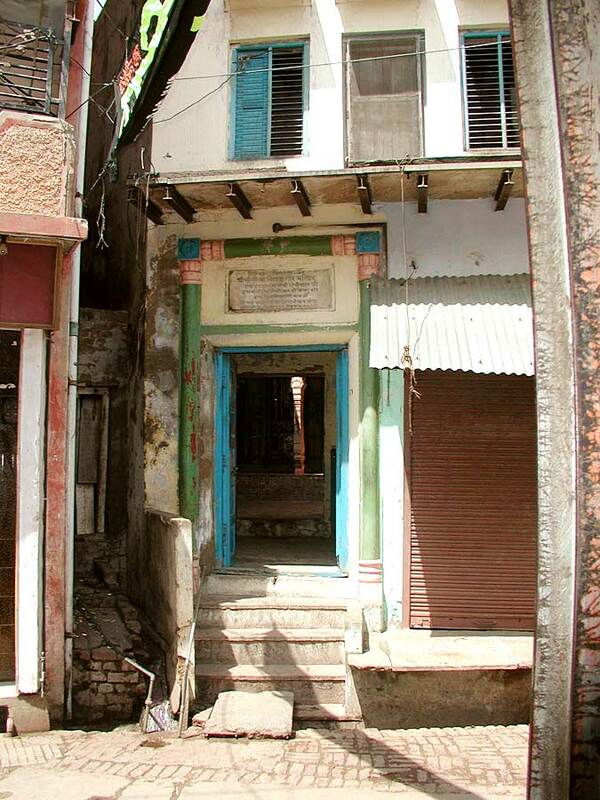 Prasanna dasi of Serpura Beguda lived in Vrndavana. One day she dreamt that Gaura and Nitai were decorated with all kinds of dazzling ornaments and came before her. Showing Their lotus feet, which were marked with flag, ankusa, thunderbolt, etc., and which are desired even by Brahma and Siva, They said: "Look at all the ornaments We got. But We don't have nupura (footbells). Give us nupura." Upon awakening, Prasanna dasi went to Pisima and narrated the whole story, streaming tears of love. Having them made and then putting the golden nupura on Gaura-Nitai's lotus feet, her life became successful. For some days one babaji, a very pure, dear servant of Lord, was assisting Pisima in the seva-puja of Nitai Gaura. An impure idea arose in his mind. Opening the temple door at night, he stole the ornaments worth Rs.500 and left with them. Arising early next morning, Pisima was horrified to see that the door was opened and the Deities were without Their jewels. She thought, "Oh who has done this despicable thing? Is there anyone so sinful living in this world?" Full of anxiety, she fell down in the corridor of the temple and remained there, devastated and depressed. She saw Gaura-Nitai in her mind and said, "Who took your jewelry? They replied, "Ma, that Vaisnava is very poor, but he fed us brothers so much rabdi. So we gave it to him. Please, don't say anything to him about it." What did she do? She was furious over the behavior of these spoiled children. From where would she get more jewelry? Personally, she had already left her own incomparable wealth long ago - coming to Vrndavana in beggar's dress, her only possession was now Sri Sri Gaura-Nitai. Laughing, she said, "Okay. You can either give Your things to somebody or keep them. What's it to me? If you need something again, then You'll get it from somewhere. You certainly aren't bashful about asking people for things." In another dream, Gaura-Nitai told Pisima, "Take us out for Braja-mandala-parikrama." She then readied a palanquin and assembled some devotees for Harinama-sankirtana and they set out the very next day. The Deities were extremely happy on this trip. After a month or so, when They were concluding the parikrama and were at the outskirts of Mathura, Pisima went with one devotee, Krsnadasa, to make arrangements ahead. Mathuradasa followed behind with the palanquin. At that time, there were British soldiers camped in Mathura. Some of the soldiers were curious about the spectacle of the parikrama procession. Pointing at the palanquin, they asked, "What's in that?" Mathuradasa replied, "Thakuraji is inside." The soldiers garrulously said, "Let's see Thakuraji!" Mathuradasa became afraid - somehow the mlecchas shouldn't touch the Deities. He replied in a very humble voice, "Just now Thakuraji's darsana won't be possible." His comment had escaped the attention of the soldiers, who overwhelmed him and tried to see the Deities. At that very moment, a blinding flash of light bolted from the palanquin, as powerful as thunder, and blasting them away, scorched the eyes of the soldiers. Screaming out, "Oh God!" they all fled in terror. When Mathuradasa later narrated the whole episode to Pisima, she said, "Now my boys are able to take care of Themselves. I'm very happy to know this. Now I have no anxiety." Pisima thus passed many years, serving Gaura-Nitai faithfully. Even when she was 100 years old, she continued to take three baths daily in the sacred Yamuna and personally performed Gaura-Nitai's seva herself. But gradually this became impossible for her to continue and so she entrusted the seva-puja to Gopesvara Gosvami, a devotee in the family line of Lord Nityananda. He was a staunch bhakta but wasn't very experienced in Deity seva. Thus he happened to bathe Gaura-Nitai in cool water once, at the beginning of the cold season. They caught a cold and Their noses began to drip. But Gopesvara Gosvami didn't even notice this. Pisima mostly stayed on the second floor - she could not easily negotiate the stairs anymore. But in temple, the Deities were sad because Pisima wasn't there anymore to pamper Them with her maternal attentions. Somehow Pisima perceived this. She came down one day and saw that Gaura-Nitai's eyes were red and Their noses were dripping. Going near Them, she felt that They were hot. She could not bear this. She wiped Their noses with the edge of her sari and called for Gopesvara Gosvami. Crying, she said in disbelief, "How could you do this? Bathing Them in cold water, you've now made Them sick! See how Their noses are running!" She wiped Their noses and showed it to him. Gopesvara didn't believe it and he told her so. Pisima fairly bristled with anger. She indignantly held the other end of her sari to Gaura's nose and then thrust it into his face, saying, "Gaura's snot!" Just then, Gaura's nose began to drip again. This filled the temple with an unprecedented, divine fragrance from beyond this world. Astonished and full of remorse, Gopesvara fell at Pisima's feet and begged forgiveness. During Pisima's presence, everyone was afraid of inciting her wrath. Everything had to go according to her desire. If anything at all went against her wishes, she would become enraged and no shortcoming could withstand the face of her display of anger. Ten lamps used to be lit above the temple doorway. On the Kojgara-purnima day, Gaura-Nitai used to enjoy Themselves on the veranda. One day it was Kojgara-purnima. After the evening arati, Gopesvara Prabhu had gone out somewhere, extinguishing the ten lamps, since their oil was expensive. That day Gaura-Nitai were not even taken out onto the veranda. In the temple, only one flame was burning, in a large brass ghee lamp. Pisima was seated on the veranda chanting Hare Krsna. All at once there was a loud sound. The temple was then engulfed in darkness. Gaura had lifted up the lamp and thrown it into a corner of the mandira. It took no time for Pisima to understand the anger of Gaura. Upon Gopesvara's return, she said, "Gopesvara! You didn't take Gaura-Nitai out on the veranda today. You also put out the ten lamps. Just see - for this reason Gaura in His anger threw His lamp and sits in the darkness. Why do you act like this?" Pisima's order to Gopesvara Gosvami was not to give prasada to anyone before having taken their donation. One day, someone placed two annas before the Deity and requested prasada. Gopesvara Gosvami neglected Pisima's order, or perhaps he didn't notice the donation, but he gave prasada to that person. This time too, Pisima was sitting on the veranda chanting japa. She saw that a candana-grinding stone came barreling out from within the mandira, as if someone had very forcefully thrown it. Dashing and knocking against the sides of the veranda, it went into an adjoining room and struck a large pot filled with grains of rice. The pot was shattered, the rice scattered. Calling Gopesvara prabhu, Pisima said, "See Gaura's two-anna's worth of anger? He broke my big pot and scattered all the rice. Why do you do things that make Him so angry?" After this incident, Gopesvara prabhu became more careful in Gaura-Nitai's seva. When she was 103, Pisima mentioned to Gopesvara Gosvami that she would someday leave her body. On that very day, in good health, while sitting before Gaura-Nitai, beholding Their beautiful moonlike faces and chanting Their names, she gave up her earthly body and entered the eternal pastimes of the Lord. Once, after the disappearance of Gosvamini Pisima, Gopesvara Prabhu became dreadfully ill with smallpox and was bedridden for a month. He eventually lost the power to speak and then even fell into a coma. It seemed as if he would die but even in that condition he was able to render service to Sri Sri Gaura-Nitai internally. Late one night he saw that a fearsome raksasi was trying to take him away but just at that time Pisima Gosvamini and Gaura-Nitai came to his bedside and the raksasi disappeared. The greatly merciful Nitai stroked Gopesvara's limbs with His transcendental hand and said, "Dada (uncle), if you remain so listless, who will give us anything to eat? Get up! We're very hungry." Shortly thereafter, Gopesvara Prabhu regained consciousness and coughed up a great deal of phlegm. Sitting up in bed, it then seemed that there was no more disease in his body. Srila Gopesvara prabhu was a brahmacari from his childhood. He always used to tour holy places before coming to the service of Sri Sri Gaura-Nitai. It was against his nature to be bound to one place. Therefore he initially hadn't wanted to accept the service of Gaura-Nitai. But, being helpless, in the face of Pisima's strong insistence, as well as Gaura-Nitai's desire, he had to accept the seva. He would personally do all of the cooking, offer all of the bhogas, all of the aratis, all of the sringaras, sing the kirtanas, even up to scrubbing the Thakuraji's pots, and all the other services as well. Sometimes, becoming fatigued after this work, he would even abusively swear at Sri Sri Gaura-Nitai. Some time after Pisima's disappearance, one day Gopesvara Prabhu considered, "What is the gain from all of this seva that I have done? So many days I have spent doing puja, but nothing has happened. If I go to do bhajana in seclusion, something would happen." Thinking in this way, he entrusted the seva to another person and went to Kusuma Sarovara with the intent of doing his own bhajana. At midnight on the third day, while doing his bhajana seated beneath a bakula tree on the bank of the sarovara, he saw a transcendental vision - it seemed as if Nitai and Gaura were coming to him. Arriving there, They stood before him and said, "Dada! Today, for three days we haven't had any food or water - chalo!" Vrndavana; I'll do bhajana right here!" The mahatma told him to take prasada and get a little rest. A little later, when his anger had subsided, he was contrite and agreed to go to Vrndavana. As he arrived in the village of Datiya, it was dusk, and it began to rain very hard. With the intention of waiting out the evening there, he stayed in the house of a Vrajavasi. Meanwhile in Vrndavana Gaura-Nitai were anxiously awaiting his arrival. Each and every second was a great burden for Them. As soon as it was morning, one tanga-wala (horse cart man) who had been searching everywhere for Gopesvara Gosvami, arrived at the house of the Vrajavasi. He said, "Where is Gopesvara Gosvami? I'm here to take him to Vrndavana. I was ordered to do so in a dream." Climbing onto the tanga, Gopesvara prabhu went to Vrndavana. As soon as he arrived in the doorway of the temple, he perceived a terrible odor. He asked the pujari, "What's this smell?" The pujari answered, "I don't know; for three days I haven't even been able to go into the temple on account of the stench." Gopesvara prabhu went into the temple and investigating every direction, saw that a rat had died on top of the Deities' mosquito net. He then cleansed the temple and washing and wiping everything, he started the seva again. Gopesvara Gosvami was a staunch devotee of Lord Caitanya but he aspired to worship the Lord in sakhya-rasa. During the time of Pisima Gosvamini, Nitai-Gaura had the forms of children, in accordance with her maternal devotion (vatsalya-rasa). The core of his heart wasn't fully satisfied in the service of Bala-Gaura and Bala-Nitai. As soon as Gopesvara Gosvami prabhu assumed the seva, an extraordinary thing happened. According to some, Gopesvara Gosvami had incessantly prayed to Nitai-Gaura, and as a result of his supplications, They gradually began to grow, such that within a few years, They assumed Their present form as full-fledged youths. But others say that when Gopesvara once told Pisima that he wouldn't be able to worship such small Deities with complete love, she then went to the temple with him and lifting both brother's chins, raised Them up to Their current dimensions. Whatever happened, those who had seen Them in both conditions attested that the two Deities were previously smaller.